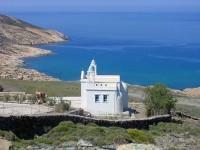 Windmills Travel and Tourism is pleased to present its new website devoted strictly to Tinos Island. Long in the planning stages, we are so pleased to finally present online our new website about the many wonderful aspects of Tinos. To say that its creation was a labor of love is only to tell half the tale. The other half must be attributed to the upgrading of the island’s tourist infrastructure, which has changed so much over the past few years (and for the better we might add). So, it has always been merely a question of timing, and now, the time is right! The Windmills team has put together some really excellent accommodation choices, plus a variety of tours and excursions to satisfy just about everyone. You’ll find some very good Packages with outstanding itineraries, particularly our Two-Center holidays, which primarily focus on two islands in two weeks, an excellent way to get to know a destination. We also feature two new sections, one for Weddings, and the other for Baptisms. Tinos is a perfect venue for both. Windmills Travel has been an inbound travel agency based on the island of Tinos since 1979. Since then, our agency has branched out to Mykonos Island, where it has become one of the finest inbound agencies on the island, and a leader in the gay travel industry, just one of their many specialties. Now, and for the past few years, Windmills has an ever-growing presence in Athens City as well, our new base for handling all of Greece, as well as international bookings world-wide. While we’ve grown over the years, we have not lost our focus of providing top quality services at fair prices. Our clients’ satisfaction is our main goal … past, present, and future. That is the Windmills’ guarantee!